1 of 1 Heat oven to 350 degrees . Line two mini muffin pans with paper liners; set aside. 1 of 3 In a medium bowl, whisk together flour, baking powder, salt and baking soda; set aside. 2 of 3 Beat eggs, butter, sugars and honey in a large bowl on medium speed until well-combined. Add the baby food and cinnamon; beat until smooth. Fold in the pecans. Slowly add flour mixture using a sifter; fold in until ingredients are well-mixed. 3 of 3 Divide batter among prepared muffin cups, filling them 3/4 full. Bake at 350 degrees for 12 minutes or until toothpick inserted in centers comes out clean. Remove cupcakes from oven to a wire rack and let cool completely. Repeat with additional mini cupcake liners and remaining batter. 1 of 2 In a large bowl, beat confectioners' sugar, butter, cream cheese, condensed milk and extracts on medium speed until smooth. 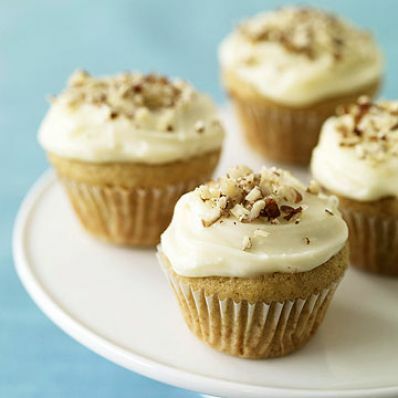 2 of 2 Frost each cupcake by putting a generous dollop of frosting on top with a spoon. Garnish with ground pecans.